There must be a gypsy somewhere in my background. I love rich bohemian tapestries, jewel colors, and travel. Anytime a gypsy-themed digital kit or photo collection becomes available, I have to add it to my stash. Last year, I showed you the Gypsy Diary that I made as part of Tangie Baxter's Gypsy Diaries Mixed Media Worskhop. Since then, I've been scouring the shops for all things gypsy to use on the inside pages. Two of my favorite digital kits are Tangie's Gypsy Rhapsody and Pink Lotty's Gypsy Caravan. Imagine my excitement when I saw that Deviant Scrap has but together a store-wide collaboration celebrating all things bohemian, La Vie Boheme. Here are a couple of pages that I put together using Tumble Fish Studio's kit. As much as I love Photoshop and digital art, there are times when I just need to play with paint and paper. That's when I work on my projects for Paper Traders, a Yahoo group that offers challenges, swaps, and fellowship for artists of all levels of experience. This year, I'm participating in a word prompt challenge in which we're offered a theme and technique to incorporate into a monthly art journal page. This month's prompt was "Give More"and the requirement was to use graphitti style lettering in the design. Graffitti-style lettering? Does that mean using spray paint? Yes! I finally had a use for that can of black Liquitex spray paint that had been sitting on the shelf gathering dust. I started off by loosely applying adhesive letters to the page and spray painting that area. After pulling off the letters, I added acrylic paints in a variety of oranges, yellows and reds. Nancy Baumiller's collage images worked perfectly for the page, and I finished it off with gelatos, adding color and shading. It's not my typical page, but I like it. I think I'll be buying more spray paints, and I promise they won't be sitting on the shelf. A good friend recently told me that she didn't recognize my art journaling pages anymore. And she's right, they have been going in a whole new direction. After years of studying the styles of my mixed media idols (Teesha Moore, Tangie Baxter, Marsha Jorgenson, and Ingrid Djikers), I am finally finding a style that incorporates many of the styles and techniques that I have learned, but that feels authentic to me. Like me, my new art is little vintage and a little funky. Inspired by words, quotes, and my own life experiences, my journal pages finally feel "real" to me, and isn't that the most important thing of all? This first one was featured on this week's Art Journal Caravan blog. And this one was featured on yesterday's Gallery Standouts. Credits: Sissy Sparrow's Room 19 Project 4 and Burn Thistles Mini, Tumble Fish Studio's Winter Junque (girl), and Christina Renee's Build a Blossom. The font is CK Deco. Here's another one combining vintage images with grunge. Credits: Captivated Vision's Another Man's Treasure and I Believe in Second Chances; Rucola Designs Wacky 13 hand (used as template) and Tumble Fish Studio's Random Favorites (glasses) and Etcetera (woman). The font is Acoustic Bass. And then, there's my personal favorite. Credits: Tangie Baxter's BE kit and Collage Fodder-Eyes, Mouths, Tumble Fish Studio's Autumn Junque and Captivated Vision's Colour Rage. The fonts are 1942 Report and Rage Italic. About six months ago, I discovered the wonderful Paper Traders Yahoo group. Since then, I have been learning new techniques, making new friends, and participating in a variety of art swaps and challenge. Now it's your turn to discover what Paper Traders has to offer.. Follow along on our first annual blog hop, and get to know me and a few of the other group members better. See our art and get a chance to win some nice prizes along the way. And, if you are inspired by what you see, consider joining the group and participating in our swaps and challenges. Each member will share a little bit about herself and offer either a handmade art piece or other quality prize. I'll be giving away this lovely handmade envelope art journal and collage pack to one lucky winner. I learned to make the journal while taking a class from Terri Kahrs at the online 21 Secrets Workshop. The collage pack includes the beautiful Indian Summer papers from Basic Grey, one of my personal collage sheets, and an assortment of ephemera and tags. Just leave a comment below to enter the random drawing. Enjoy your journey, and come back to visit soon! Blame it on spring, but my head has been in the clouds lately. I just realized that I had neglected to post not one, but three, pages that I created as part of my creative team duties at Tumble Fish Studio. The first is based on a theme that I keep returning to. I call it my Garden Girl series. Credits: Tumble Fish Studio's Shades of Green kit from Deviant Scrap. This one is just a piece on nonsense that I came up with when I saw the hair tonic image next to the fish image as I played in Photoshop. And this last one is a tribute to the old movies, and the beautiful women who wanted to be stars. A true story: I have two great aunts who ran off to Hollywood to become movie stars. As their older sister explained, "People told them they were beautiful and they believed it." Credits: Tumble Fish Studio's Méliès-ish kit at Deviant Scrap. We're trading art journal pages over at Paper Traders as part of our monthly tip-in project. Each participant chose a journal theme back in January, and we're taking turns completing spreads for each other's albums. When we get our spreads, we insert, or tip in, the pages into our own journals. For April, I completed two pages for Pam using the theme of Fairies. I think this may just be the grumpiest fairy ever. Don't you just love it when others recognize your work? I know we shoud do art for ourselves, but a little pat on the back never fails to brighten my day. Yesterday's I am a Book page was featured on the Gallery Standouts blog. And Down by the Sea, a two-page spread I did for an art journaling swap at Paper Traders was selected as an April Gallery Standout at Deviant Scrap. Down By the Sea is a mixed media art journal page using collage, paints, gelatos, and stamps. Images are from Tumble Fish Studio's Summer Junque and At the Beach collections. Maybe, it's the fact that the sun is shining, or that I cannot get away from the sound of birds chirping. It might be that I had a wonderful spring break, playing with my grandson. Or, perhaps, it's that I am finally getting over the aches and pains of winter. But, whatever the case, my art journaling pages are suddenly filled with bright colors and encouraging words. I am in my happy mode, so don't be surprised if you see fairy wings soon. Here are a couple of digital art journal pages that I completed this weekend. Credits: Beth Rimmer's Artful Scribe, Rucola's Funky Soul, Crowabout's Bits, Borders and Parts, and Tangie Baxter's Big Fat Mess overlay and DoDo font. Credits: Crowabout's Funky Junk and Odd People & Borders, Holliewood's The Collector, Maya's Striped Legs, Beth Rimmer's Junque Journal, Denise Docherty's Get Organized, and Tangie Baxter's Gnat font. Seriously, I have to stop. I am addicted to art journaling and art journaling classes. 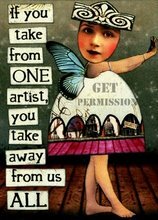 I'm currently enrolled in the Brave Girl's Club Body Restoration class, Tangie Baxter's Art Journal Caravan, Julie Shahin's What If Every Art Journaler Read the Same Book, and Paper Traders Tip In and Art Journal challenges. Plus, I am still finishing up Tangie Baxter's Gypsy Diaries and the Brave Girls Club's Life Restoration classes. A smart woman would give up some of the classes, or at least put them on the back shelf. I guess I am not a smart woman. I just keep plugging along, abandoning one project for weeks to work on another, and then coming back to it when the muse strikes. Here is a hodge podge of what I've been working on. I finished the cover for What If Every Art Journaler Read the Same Book. We are reading SARK's Fabulous Friendship Festival. This is cut-and-paste on an 8x8-inch chipboard cover. Credits: Graphic 45 Cirque papers, Tumble Fish Studio's elements, Basic Grey buttons. I've completed a couple of new pages for the Art Journal Caravan. They're both digital. Credits: Tangie Baxter, Rosey Posey and Captivated Visions Shine from Within collection. Credits: Julia Makotinsky Art Fusion; Tumble Fish Studios Divas and Miscellany; Tangie Baxters AJC 2013, AJC 12 Parcel 10 and AJC12 Parcel 19; Holliewood Art Journal 2; Rucola Bad Student; Captivated Visions I Believe in 2nd Chances; and Christina Renee Purty Buttons. The font is brother bear. I pulled out the paints, and practiced my lettering for this art journal spread for the Paper Traders' One Word Art Journal project. This month our word was Simplify. And, finally, here's a spread for the Paper Trader's Tip-In Project. We're creating spreads for other member's journals. Back in January, I worked with the theme Trees.